Originally an Ark-Ship and one of Earth's earliest attempts at extrasolar colonization, FTL travel was invented before the ship's occupants reached their intended destination. The cryogenically preserved passengers were rescued and brought back, the ship itself left to drift as a monument to the period. Several centuries later, the ship was rediscovered by a gang of outlaws and vagrants, and retrofitted over a long period to be fit for long term habitation. Centuries down the line, the Neon Light is now a massive mobile hub of those dissatisfied with corporate control or government oversight, and survives as a gigantic center for black-market or traditional trade. The ship, structurally, is several rotating rings around a large central column. Most habitation, trade, and general living occurs in these rings, with gravity generated with centrifugal force, while the central column has no gravity in areas not outfitted with more modern gravity plating. The entire ship is dotted with docking ports for more mobile fighter or freighter ships, as well as manned and unmanned point defense turrets. The top of the central column is the "Bridge," with gravity plating, housing for ruling families, and controls for the ship at large. The rear holds traditional nuclear reactors as well as the ship's FTL drive. The rest of the column is largely storage or travel space, as well as agricultural or life support systems. 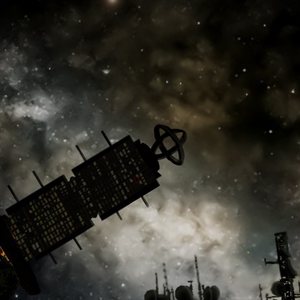 Despite the scrapmetal appearance of the ship at large, life support, food, and water are fairly closely controlled in dedicated agricultural and life support centers. Life support is provided by several methods, including electrolysis of exhalation, oxygen recycling through algae and other plants, and otherwise. Food is mostly grown from several genetically modified plants and combined into a largely tasteless nutri-paste, the default food available when other options are not. Protein is cultivated from bio-vats, either mixed into nutrient paste or sold in slabs. The ship approaches one hundred percent efficiency for life support, but doesn't quite reach it, making trade for food, water, and the like a rare necessity. 20,000 inhabitants. Mostly humans with a decent number of Skrell and a handful of Unathi and Tajara. Positronics are uncommon because of the scarcity of replacement parts. Imports raw materials and luxuries. Exports finished products and services. Several government-owned colonies refuse to trade with the ship in order to not be seen as fraternizing with outlaws, but many corporate installations see them as just another customer, even if they must occasionally be traded with off the books. It's worth noting that it's not entirely uncommon for independent groups (and leading families will adamantly deny funding or encouragement of these groups) to raid poorly defended ships or even colonies for supplies, goods, and money. It's seen as a distasteful, but necessary, business. Forgotten or destroyed ships are often also carved up for materials. Internally, trade is unregulated and chaotic, mostly being barter with basic food and water a nonconcern, with thalers being traded to make up the difference in value. If any corporate activists on onboard, they keep it to themselves- it would either make them distrusted and shunned at best, or shot in a maintenance tunnel at worst. The ship is run by a somewhat anarchic matriarchal meritocracy. Each sector of the habitation rings elects a family to represent them based on their skill or local popularity. These families then attempt to gain the trust and awe of the population at large through feats of skill, producing exceptional products, through exceptional leadership skill, or otherwise in order to be supported as leader of the ship at large. Officially the oldest eligible female in the family is the true leader and has the final say, but the responsibility is often shared among the entire family. A reelection is held whenever the current matriarch of an elected family becomes a grandmother- if the same family is held to continue their rule, control passes to the oldest daughter. These families often mark themselves to prove themselves as distinct; through unique tattoo styling and coloration, through a familial specialization in a trade, or otherwise. In short, politics within the Neon are often chaotic and roughly held together, guided under several families with a common will to see the ship functional and its people happy. Current leadership is under the Crow family of the First Stacks, with matriarch Kenya Crow. The retrofitted original habitation ring for the cryogenically preserved colonists- each pod has been retrofitted into a sort of pod bed. Cramped, dark, and crowded. Inventively named second ring added on after the original 'colonization' of the ship. Much larger than the first, with rooms equivalent to ramshackle modern hotel rooms. Most trade occurs here, with designated market spaces. Even more inventively named, currently unfinished, third habitation ring being built to prevent population crush in the Stacks. A 0-g good and personnel travel chute in the middle of the central column, for moving around the ship and between rings. Also has lots of storage space. Cubic agricultural and life support space. Being assigned to work here by a ruling family is often a punishment. Has no gravity. Housing for ruling families, with modern gravity plating and controls for the ship at large. Placed on the front of the central column.